Have you ever noticed that the faster you try to go the slower you actually go? If so, you’re not alone. I find that trying to jam as much as possible into the smallest possible space never works. Taking my time is a way for me to go faster. Going fast means you’re out of control. Do you find that when you’re trying to go really fast you often feel out of control? I know I do. Every time I go really fast I get nervous. I feel like I’m forgetting something and I often am. When I’m trying to go fast I know that I’m annoying people around me. I’m asking for things at the last minute and I’m disrupting the plans of others. Sometimes you have to disrupt and change priorities. If you’re doing this on a regular basis you’re keeping those around you from working in an efficient manner. Is this what you want to accomplish? Going fast means you get to do it again. I can promise you one thing: If you’re going at top speed all of the time you’re making lots of mistakes. You know what happens when you make mistakes. You get to do it over and over again. If you took a little extra time and slowed down you might do it right the first time. I know that when I go fast, I go slow. It’s not that I’m moving slowly, it’s I’m not getting things done. I spend too much time trying to remember what’s next. I’m not being thoughtful about what’s important to do. I’m looking to skip steps that I know I should follow. Going fast burns out people you work with. We can only go so fast for so long before we run down those around us and ourselves. If you’re forcing those you work with to go at top speed all of the time, you’re asking for a core meltdown. I bet you know what comes next. A core meltdown is usually accompanied by a slow down in what gets out the door. Instead of concentrating on producing something positive you get to try to mend bridges for what you’ve broken. Going fast is going to cost you your relationships with those you work with. Everything can’t be done at 110% speed. Some things just take time. When you try to do a process in thirty minutes that takes two hours you’re going to miss things. If you don’t catch them before they leave your company, your customers will. This not only makes you foolish; these mistakes help you lose trust with your customers. If you find that you are trying to move too quickly you’ll continue to ship shoddy goods, which gets you one outcome. Your customers will start looking for another supplier. 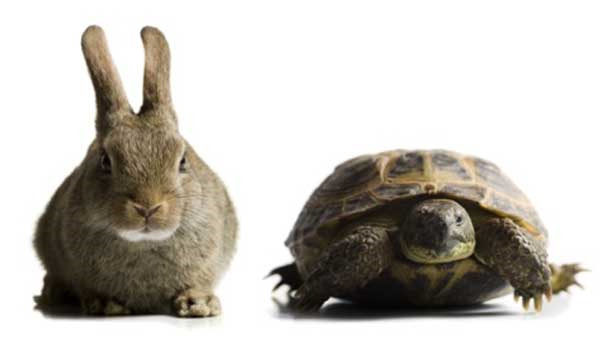 Going slow means you have a chance to think about it first. I like being thoughtful. If I take my time and plan well before I start I find I go much faster. I knew of an electrical contractor that would have his team plan each of their jobs in detail in the office before ever leaving for a job. This allowed his team to work much faster in the field. They didn’t stand around waiting for material to arrive. They didn’t stand around trying to figure out what to do next. They knew and the material arrived on time. The end result was they got a lot more work done a lot quicker than skipping the planning phase. You don’t want to plan and never get around to doing your work. You don’t want to rush and have to do it over again. There is a balance that gets you to the right place. Experiment and you’ll likely get the right balance. Part of going slow is knowing what you want to do. One of the things I think brings balance to the project is what we call Four Tiered Budgeting. I’ve written a case study that explains how to use this process. To get your own copy of this case study, click on the button below. Securities and Investment Advisory Services offered through NFP Securities, Inc. (NFPSI), Member FINRA/SIPC. Stage 2 Planning Partners and NFPSI are not affiliated. This article is published for residents of the United States only. Registered Representatives and Investment Adviser Representatives of NFP Securities, Inc. may only conduct business with residents of the states and jurisdictions in which they are properly registered. Therefore, a response to a request for information may be delayed. Not all of the products and services referenced on this site are available in every state and through every representative or advisor listed.